Holywell & Bagillt Minibuses (incorporating Alston Court Travel) is a family run business, established in 2009, based in Flintshire, North Wales. We mostly operate in Flintshire, Denbighshire, Conwy and the Chester vicinity however provide transport to our Customers all over the UK. We provide a minibus hire service with driver for between 1 and 16 passengers for any occasion to any UK destination, sepcialising in airport transfers. Our minibus service offers private hire for any occasion including airport transfers, corporate transport, school transport, transport to UK holiday destinations, nights out/special occasion nights out, wedding transport and much more. Whatever your transportation needs, we can meet them with a reliable and friendly service at the best prices. 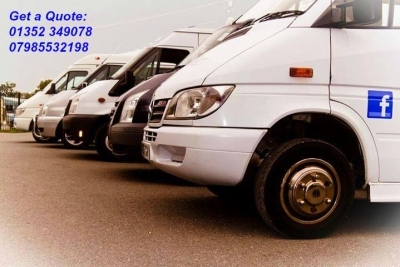 At Holywell & Bagillt Minibuses, we only use modern, clean and well maintained vehicles. All our drivers are fully trained, holding both a PCV driving licence and Driver CPC qualifications. All our drivers are also CRB checked with Flintshire County Council. Whatever your transportation needs, please contact us for a quotation. If you find the same quality of service at a lower price elsewhere, we will try our best to beat that price. Contact us now and speak with John for a quote on 01352 349078 or 07985532198.